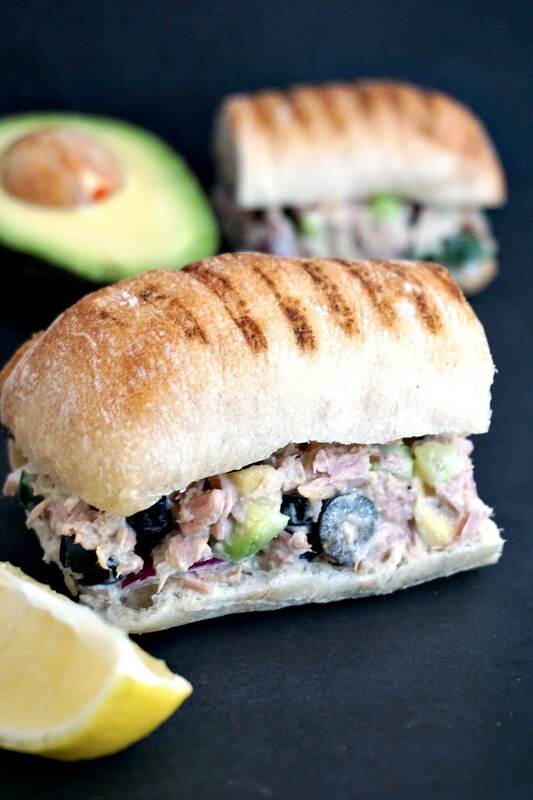 My simple tuna salad sandwich with avocado, black olives and cucumber ticks all the boxes if you are looking for a quick and easy, but also tasty bite. And so healthy too! Breakfast, lunch, dinner, it really doesn’t matter the time of the day, this sandwich can be enjoyed whenever you want. Now, the word ‘simple’ can be misleading, don’t be tricked into thinking that’s a plain boring sandwich. Oh, no! Far from that! It’s simple because preparing it is dead easy, it won’t even take you 5 minutes. A bit of chopping, a bit of mixing, and your super amazing sandwich is ready. You can pat yourself on the back now, you’ve done great eating yummy stuff. How easy was that?! And do you know what else it’s great about making your own sandwich? It’s a lot cheaper than buying one. A tuna sandwich won’t cost you less than £3 at least. That might not seem that expensive, but just think about it; if you are at work and get yourself a sandwich every day, that’s £15 a week at least. So we are taking £60 a month for a tasteless sandwich made with not-that-great ingredients. I know that many supermarkets have (at least here in the UK) meal deals, where you get a smallish drink and snack too, but those sandwiches are rather yucky. So, my alternative is a lot healthier and better for your pocket. 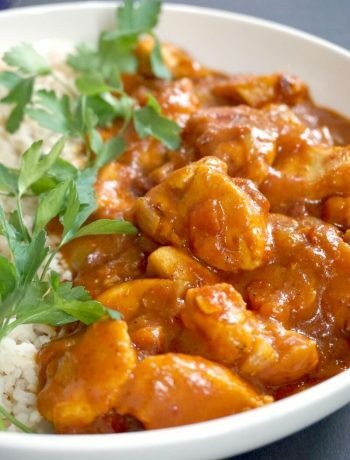 Plus you know you’ve used fresh ingredients. Another bonus point here. How do you make a tuna salad sandwich? peel and slice the avocado, and add it to the bowl too together with the chopped red onion, olives, and cucumber. Tuna in oil or tuna in brine for tuna salad? My tuna salad sandwich uses mayonnaise, which is rich and has added oil anyway, so I think there is no need for more oil. That would make the salad heavy, so ideally you should use tuna in brine, for a lighter, more delicious salad. The only thing you have to watch out when you go for canned tuna, or any other canned product, it’s the sodium, which is pretty high. So adding salt to the tuna salad really is unnecessary, as it’s salty anyway. Well, unless you really love super salty stuff. But other than that, canned tuna is absolutely safe to eat, and healthy too. What else can you add to a tuna salad sandwich? If you don’t happen to have avocados and black olives, not to worry. It will still tastes great just with the freshness and crunchiness of the cucumber. This really balances well the saltiness of the tuna. A great substitute is celery, it will give you the same nice crunch. Or, instead of black olives, you can use sweet corn. The tuna salad sandwich really is versatile. As for the bread, l used ciabatta rolls, but you can use anything you like: white or wholegrain bread toast, tortilla wraps, buns, plain bagels, baguettes, etc. See, l told you this sandwich is simple. Anyway, if you fancy something else, what about a healthy and delicious Chicken and avocado wrap?It’s absolutely divine!!! 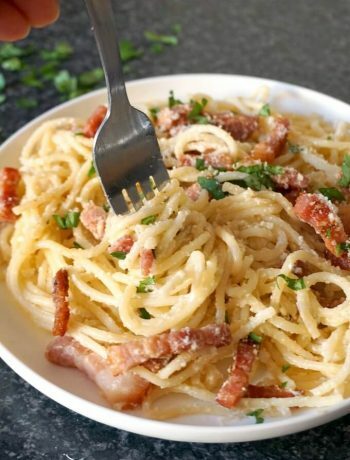 The simple recipes are really the best! 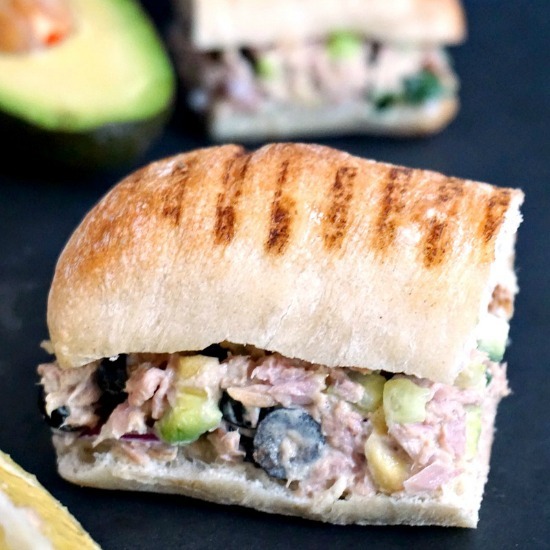 If you’ve liked my SIMPLE TUNA SALAD SANDWICH RECIPE or any other recipe on the blog then don’t forget to rate the recipe and let me know how you got on in the comments below, I love hearing from you! You can also FOLLOW ME on FACEBOOK, and PINTEREST to see more delicious food and what I’m getting up to. 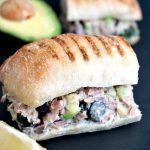 Simple tuna salad sandwich recipe with avocado, black olives and cucumber, a healthy, delicious, quick and easy lunch or dinner. With only fresh ingredients and a lovely ciabatta roll, this is the very best sandwich ever! Drain the canned tuna and place it into a bowl. Add the chopped onion, cucumber, avocado and the black olives and mix well. 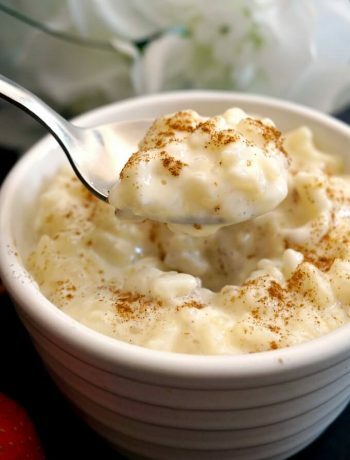 Add the mayo and lemon juice, mix and season with black pepper. 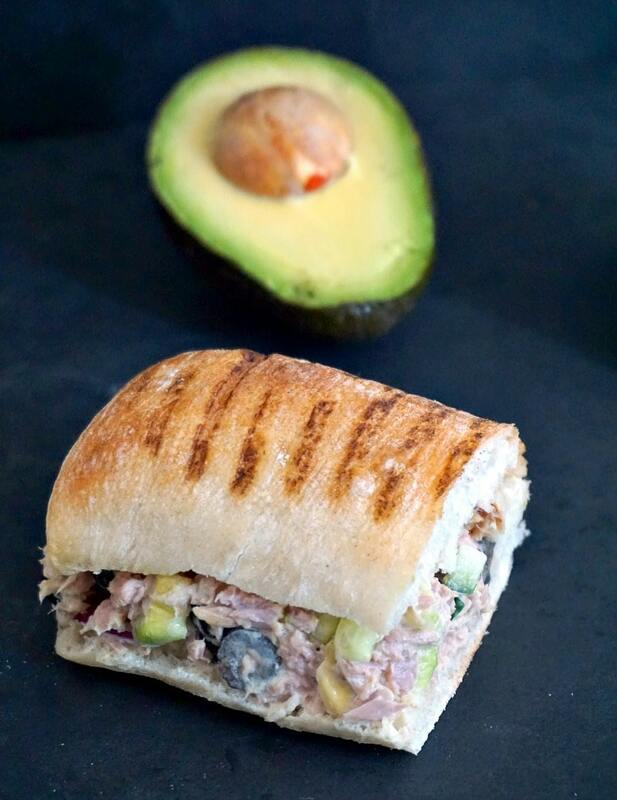 Slice the ciabatta rolls lengthwise and spread the tuna salad evenly between the two rolls.